A private community nestled near a beautiful lake, Apple Valley Lake Ohio real estate offers some of the best living available in Central Ohio. Situated on the picturesque 3.25 mile-long, 511-acre Apple Valley Lake, homeowners enjoy numerous amenities including boating, water skiing, jet skiing, wake boarding, tubing, fishing, golfing, a full-service marina, an activity center, indoor and outdoor pools, a fitness center, playgrounds and more. Apple Valley Lake is a man-made lake created in 1970 and filled in 1972. The well-preserved hills of Knox County surround the lake, which creates appealing scenery for all Apple Valley Ohio Real Estate locations. 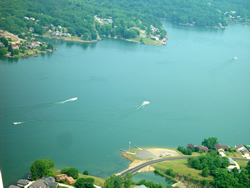 Apple Valley Lake has an average 30-foot depth and is considered by many to be the cleanest lake in Ohio. Shopping and Entertainment - While Apple Valley Lake is primarily a residential area shopping and dining can be found close by in the neighboring community of Mount Vernon, Ohio. There are many different entertainment opportunities on Apple Valley Lake including swimming, boating, fishing and more. Parks and Recreation – Apple Valley Ohio real estate offers numerous water sports including boating, water skiing, jet skiing, fishing, wakeboarding and more. Pontoon boats are allowed on the lake and there are no horsepower restrictions for boat. Apple Valley Lake residents also have access to an amazing public course at the Apple Valley Golf Course, a par-71, 18-hole public championship course. In addition there are three beaches available for swimming, as well as an indoor and outdoor pool. The Apple Valley Fitness Center is available to residents as well. Living – Apple Valley Ohio real estate is always in demand due to the private community environment, scenic atmosphere and recreational activities. One of the highlights of Apple Valley Lake is the 4th of July firework display, where Apple Valley property owners view fireworks over the lake, from boat or shore. As with any market, the home prices vary according to location but start as low $75,000 and go all the up to $900,000. Lake-front properties generally range from $300,000 to $600,000.